Halt and Catch Fire is a period drama that has not gotten nearly the amount of publicity that its other AMC brethren—including Mad Men, Breaking Bad, and The Walking Dead—have, but here it is, getting ready to start its third season and on a creative upswing. The series began its run set in Texas's Silicon Prairie, circa 1983, and focused on Lee Pace as master computer huckster Joe MacMillan, who convinces programmers Gordon Clark (Scoot McNairy) and Cameron Howe (Mackenzie Davis) to help him reverse-engineer the PC and become a major tech player. The second season's main drive was Gordon's wife, the equally accomplished programmer Donna Clark (Kerry Bishé), and Cameron's new business venture Mutiny, which eventually focused on chat rooms. For the series' third season—which is set in 1986—the action is moving to San Francisco, with Joe now running an anti-virus company and plotting his next big move, while Donna and Cameron continue Mutiny with Gordon and their old Texas boss, John Bosworth (Toby Huss). Just in time for the new season's premiere, here are some facts about the Emmy-nominated series. 1. IT WAS CREATED BY DISNEY MARKETERS. Christopher Cantwell was a marketing executive who came up with the viral Toy Story 3 promo of a fake Lots-o'-Huggin' Bear YouTube upload. Cantwell and his colleague, Christopher C. Rogers, wrote a movie script together before writing the Halt and Catch Fire pilot as a spec script, just as a way to get staffed on a writing show. "Our agents, who were trying to staff us, told us to write something that we love because we’ll never be able to sell it," Cantwell said. "We still have the email from our agents, who we love, which said 'Sounds great, interesting, but we probably can’t sell it.'" Still, they sent it off to HBO, Showtime, and AMC; AMC bit. 2. THEY SET IT IN TEXAS BECAUSE THE AREA WASN'T "EXPLOITED." “We wanted to find the place you didn’t know," Cantwell explained. "Silicon Valley, Boston, New York, IBM, Microsoft, all those stories and companies have been exploited dramatically to great effect.” But Texas, Cantwell pointed out, was also a pretty big tech player. "You had companies like EDS, you had Michael Dell making computers in his dorm room, you had Texas Instruments, and Charles Tandy who brought Radio Shack and created the Tandy computer and marketed it to great success," said Cantwell, whose father was also working there as a software salesman. When they were writing the pilot, "I sat with my dad for two hours and just talked to him about his work and the different vernacular used and loosened him up with a couple of beers," Cantwell told The Hollywood Reporter. "It was the first time I’d written anything close to real life experience. He called me after he read it and I was really nervous to see what he thought of it. He told me that it was the best thing of mine he had ever read, which meant a lot to me." 3. THE SHOW'S TITLE IS A PC COMMAND. "Halt and Catch Fire," or "HCF," was originally a fictitious machine code that would make a machine's CPU self-destruct. Computer programmers later made real HCFs. 4. THE CAST AND CREW DID A LOT OF READING TO PREPARE. The writing staff read Tracy Kidder's 1981 nonfiction book The Soul of a New Machine, which documented a computer engineering team's attempt to build a new computer, and watched documentaries like Triumph of the Nerds. 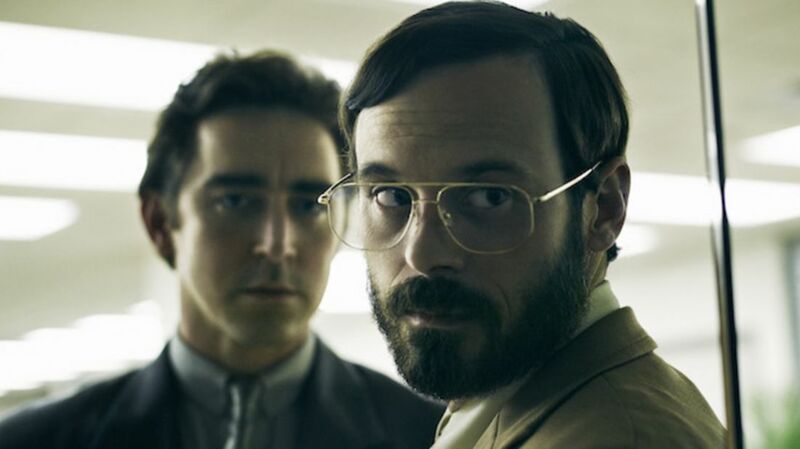 Both Scoot McNairy and Lee Pace read Walter Isaacson's Steve Jobs biography for research. Pace also read up on Ivan Boesky. Pace told The Guardian that he thinks his character has read the same books he did. "I think Joe is looking at Steve Jobs, [crooked stockbroker] Ivan Boesky, and everyone making a difference in tech and finance at that time and going, ‘God, what is that guy doing right? How can I do that?’"
5. STEVE WOZNIAK SAW A LITTLE STEVE JOBS IN JOE MACMILLAN, TOO. Apple co-founder Steve Wozniak hosted a panel with the cast and creators of Halt and Catch Fire after the pilot was screened at SXSW in 2014. Not only did Wozniak confirm that the show was realistic, but he also said that MacMillan reminded him of Jobs, describing him as "a little untrustworthy." 6. THE FEMALE CHARACTERS HAVE REAL-LIFE INSPIRATIONS, TOO. Rogers said that, in creating Cameron and Donna, he and Cantwell were inspired by the likes of Roberta Williams, Donna Bailey, Grace Hopper, and Ada Lovelace. "Looking ahead, should we be so lucky as to do a third season," Rogers added in 2015, "the respective rises of [Facebook COO] Sheryl Sandberg and [Yahoo! CEO] Marissa Mayer are of great interest to us." 7. SCOOT MCNAIRY AND KERRY BISHÉ HAD PLAYED HUSBAND AND WIFE BEFORE. Bishé and McNairy played Kathy and Joe Stafford, respectively, in Ben Affleck's Oscar-winning Argo. Neither actor believes that Argo had anything to do with them being cast as a married couple in Halt and Catch Fire. "It was just a happy coincidence," Bishé said. 8. IT MADE INTERNET HISTORY. Halt and Catch Fire became the first television show to ever premiere on Tumblr. It debuted on the social media platform two weeks before it premiered on AMC. 9. CAMERON PLAYED CENTIPEDE IN THE PILOT EPISODE FOR A REASON. "I feel like we wanted to make her representative of the wave that was coming next, both generationally and technologically," Rogers recalled. "To us, games were that, and Centipede felt just the right blend of addictive and frenetic to mirror Cameron's mental state in those pilot scenes. Also, after season one, we learned the story of Donna Bailey, the female programmer who invented Centipede but never got credit for it. We actually sponsored a video that Vice produced to help tell her story." 10. THE VINTAGE COMPUTERS ARE REAL. They get the 1980s relics from the Rhode Island Computer Museum in North Kingstown, Rhode Island. Some of the parts don't always work, but they're the real thing—including the Atari Cameron played in season two. 11. TOBY HUSS PREFERS THE SEASON TWO VERSION OF HIS CHARACTER TO THE SEASON ONE VERSION. "The show, to me, is almost two different shows," Huss, who plays John Bosworth, said. "There’s the first season, which almost stands alone from the second season, because it’s so different. I think Bosworth, in the first season, was just this tool to set the tone of that established Texas American capitalist patriarchy that they had to enter into and get caught up in. And he was, but I think they kind of liked my character, so they decided to keep me around." He added, "Both iterations of Bosworth are pretty great, but I like the second better." Rogers recalled that when he watched the last scene of the pilot, when Bosworth threatens Joe, he found himself wondering why he was on Bosworth's side. "Toby's wiry, folky energy was just such a natural fit for Mutiny ... that we couldn't have lived with ourselves if we just told another story of an older guy in the industry becoming obsolete." 12. MACKENZIE DAVIS STILL HAS TROUBLE TYPING. "I’m actually a very bad typer!" Davis insisted in 2014. "Practicing with an old keyboard in my apartment for each episode was always a bit of an uphill battle." One year later, she claimed she didn't improve. "I thought I could play it off as a character choice for Cameron," Davis reasoned, "but then I discovered how many people of that generation couldn’t type, so I guess this is period accuracy seeping through." 13. LEE PACE THINKS HIS CHARACTER IS A WALKING GREEK TRAGEDY. "He’s not a bad guy, that’s the secret to him," Pace said of his character, Joe MacMillan, before season two began airing. "There’s an idea I’ve been playing with this season—the gods hate Joe. There is a sense that no matter how hard he works, he might fail, no matter how hard he tries to be agreeable to the people he’s with, they still don’t see him. And that’s this almost Greek condition of frustration."